To view additional details for an individual payment transaction, click the transaction within the list on the Payments & refunds screen. The identification information entered as part of a credit card transaction (name, address, and phone number) will appear in the Internal notes section. Adjust the payment amount, date received, or tender type. See Adjusting or cancelling a payment. Settle all or part of the available balance to an invoice or refund associated with this contact. 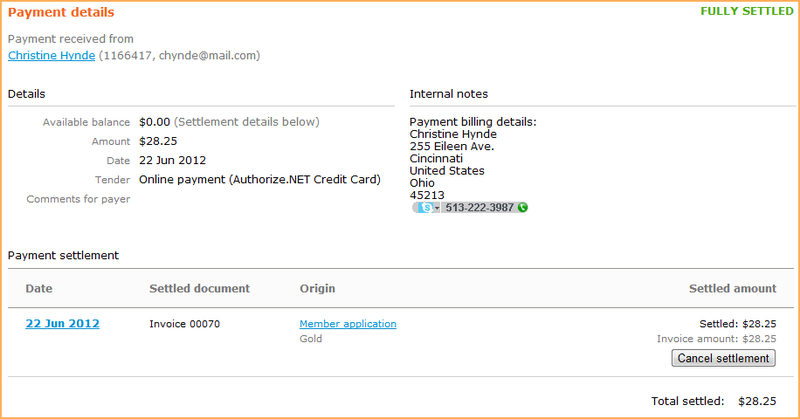 See Settling payments to invoices.